The British SPIDER-MAN weekly clocked-up a highly commendable 666 issues (it would have been a few more if the January 1979 strike hadn't suspended publication for a few weeks and don't even bother looking for issue 428, see here for why) but, for many readers, issue 633 (or - possible - 644, the first issue in the new format) marked their last dalliance with the British edition of the web-slinger. It was already getting harder-and-harder to find copies in newsagents on a regular basis and I remember that I had to resort to getting a copy specially ordered and reserved by the newsagent to ensure a copy (and - even then - there was the occasional week when, for whatever reason, that didn't happen). In retrospect, that was a sure sign that things weren't well at the Annex of Ideas. 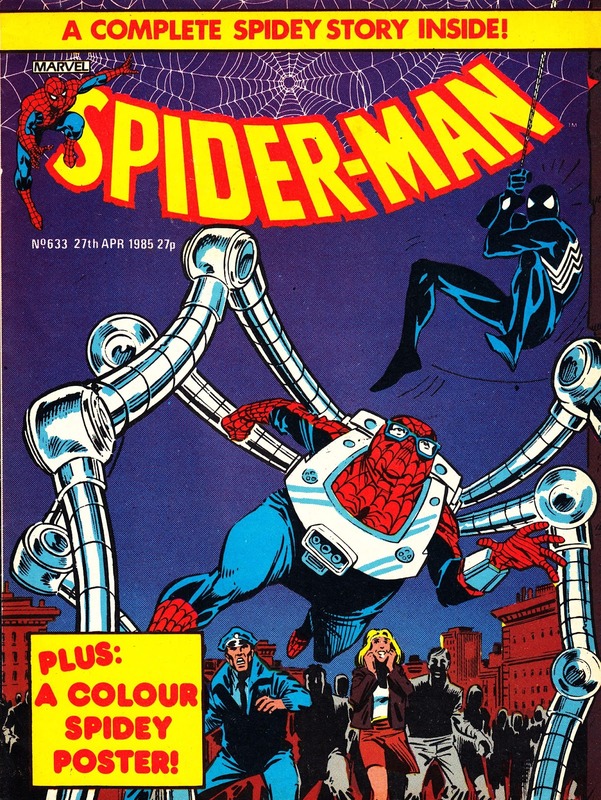 1983-85 had seen a couple of hasty format changes as Marvel switched page size, print and paper quality, page counts and colour interiors before settling on this format which used the cheapest of 'glossy' paper and had a mix of colour and black & white pages throughout. Coupled with some shoddy production work, it didn't make for the most attractive of reads. The old editorial team had bowed-out a week earlier, just after ushering in the black costume and dispatching, and returning, Spidey to (and from) the Beyonder's SECRET WAR. This issue is a blatant place-holder, burning-off a far-from-classic complete Spider-man adventure (the cover is all the hint you need about this adventure, The Spectacular Spider-Kid, from US AMAZING SPIDER-MAN 263) whilst waiting for a complete relaunch, as the more juvenile THE SPIDER-MAN COMIC, from the next issue. The thinking was that British readers had almost entirely fallen out of love with Marvel's superheroes and Redan Place were taking the company in a new direction, based on licensed properties, and (largely) leaving behind their own characters. With the imminent launch of MARVEL SUPER HEROES SECRET WARS (technically another toy tie-in), Marvel must have figured the small remaining readership would shift their allegiance to the new fortnightly (how could you resist the bulk of Marvel's heroes and villains in a massive wrestlemania ?) leaving SPIDER-MAN high-and-dry. The page of House Ads shows the fork in the road for readers. Superhero fans should follow the new launch whilst fans of - ahem - FRAGGLE ROCK should stick around. It also demonstrates the increasingly obvious lack of attention to detail by claiming the first relaunched issue was "on sale now". 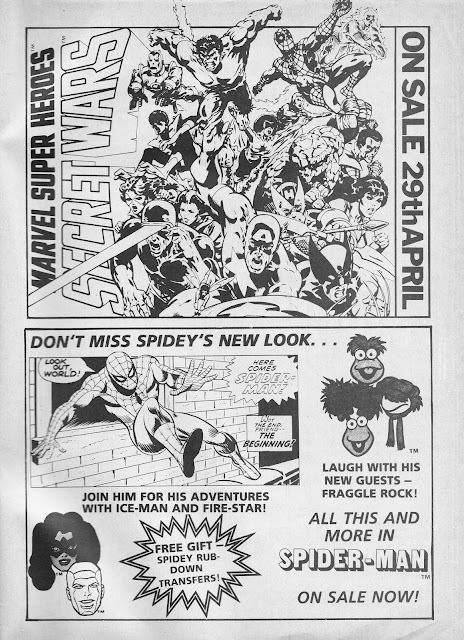 Despite seeing that ad in this issue, and other Marvel UK books, I still wasn't prepared for the horror that awaited me. The AMAZING FRIENDS adventure turned-out to be a hard-to-find promotional strip, produced as a newspaper insert for a Denver department store. It's nice to see something rare reach the UK but the reproduction was so poor that it was obvious that M-UK was working from printed copies of the American edition and not even the original artwork. Things got worse later when the Spidey strip settled into a regular run of seventies SPIDEY SUPER STORIES reprints, complete with afros, flairs, crappy super villains and blatant educational lecturing. I've previously briefly posted about the ill-fated reboot here. I have a bee in my bonnet about this but in my opinion when a comic is given a completely new look and name it should be restarted at No.1- I dispute the fact that Spider Man reached 666 issues as it began under the name Spiderman Comics Weekly and under that name reached 157 issues where it ended. It seems to have gone through loads of name changes and formats and was simply not the same comic. Ironically today's Marvels are constantly restarting at No.1 for no reason whatsoever! Hmm... interesting point. I think there's a point of prestige about having a comic which has clocked-up a high number of issues. It shows longevity. It might also have helped convince the news trade and advertisers that it was a good bet worth sticking with. I would argue that the Marvel UK SPIDER-MAN comic was the same book up until issue 634 and the ill-fated relaunch as THE SPIDER-MAN COMIC. Why? Because, although the title, format and back-up strips changed many times between 1973 and 1985, the main strip followed the same continuity and chronology throughout. 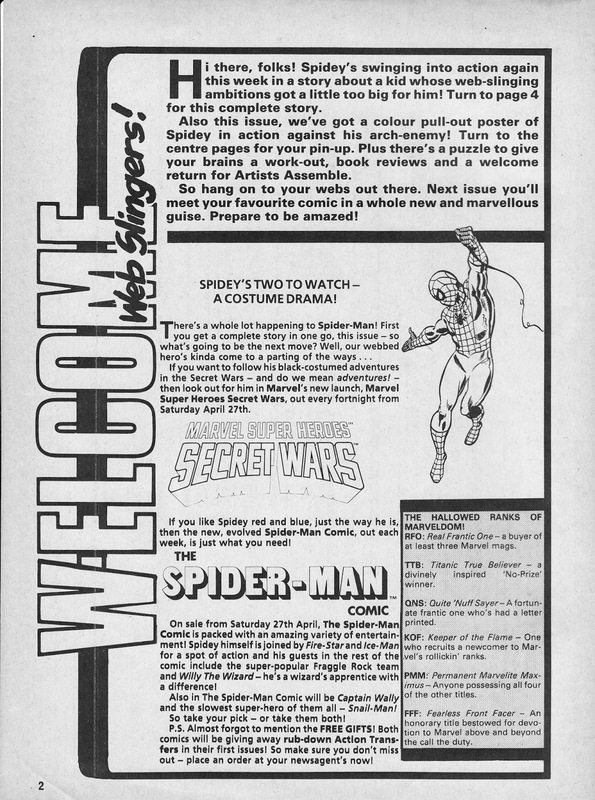 By my reckoning, the British weekly went through 16 different official titles before in closed, as SPIDEY COMIC, in December 1985. That doesn't include mergers (like FANTASTIC FOUR, THOR AND THE X-MEN, THE THING IS BIG BEN and INDIANA JONES) which didn't have any impact on the masthead. The early issues of SPIDER-MAN AND ZOIDS prominently featured "volume 2" as part of their cover design. The current issue of DOCTOR WHO MAGAZINE is 462 which means it still has to clock-up another 200+ issues to threaten SM's numerical record although, of course, Spidey was always weekly (except the brief period in early 1979 when it went on hiatus) whilst DWM has been monthly/ four-weekly since 1980. The Panini COLLECTOR'S EDITIONS do seem to reboot every time there is a major storyline or movie released. When I said above " I dispute that Spider Man reached 666 issues " obviously there were 666 physical issues but I dispute that SMCW No. 1 and Spider Man No. 666 were the same comic. By the way 666 was a rather sinister number to end on ! For me too MarvelUKs Spider-man finished with issue 633, even though I still collected after this issue. I tried to see a good reason to continue it, but however hard I looked there wasn't one. I think I cancelled my order shortly before it was cancelled it self and placed a regular order for Secret Wars. The issues after 634 are like a stain on my comic collection. I even think about binning them. Issue 634 marked a very sad day for MarvelUK and their production of Spider-man. Which is strange because there was some good story lines and artwork coming up for the web-slinger. Yup, I too continued for a while after the changes... possibly all the way into the SPIDEY COMIC period although I also bailed - in favour of THE TRANSFORMERS and SECRET WARS - before cancellation. I remember picking up a few of the (almost) final issues from a newsagent on London's Oxford Street during a day trip to London. I guess they had sat - unsold - on the shelf for a few weeks and the owner had missed his chance to send them back to the distributor (or they were on a firm sale deal). The Ewoks strip was an eye-opener as - at that point - the animated series hadn't crossed the Atlantic. The rest of it was marginally better than the nadir of THE SPIDER-MAN COMIC... but not much! I wasn't there at the end. In retrospect, I look at the three-page SPIDER-MAN strip in the Christmas issue of SECRET WARS (the never-reprinted Wide Awake Club adventure) as an unofficial merger as it appeared just after the weekly folded (or - if you like - went on hiatus to prepare for SPIDER-MAN AND ZOIDS).